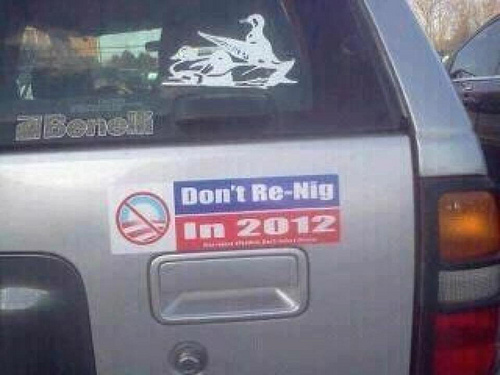 Republicans keep stooping to new lows and the racism becomes more and more blatant as the election arrives. This bumpersticker, sold by Stumpy’s Stickers, is just the latest in an ever-growing library of offensive attacks on the President of the United States by so-called patriots on the right. If you think this kind of thing is okay to say about the elected leader of the country you supposedly love, then you are another example of how today’s Republicans are racists. The fact that Americans have grown more accommodating to black people is outright nonsense. The fact is this: Obama would not be hated half as much as he is today if he were white.